Finally the day is upon us. In the AirEQ Premium review (Here), we had mentioned we wanted to bring back one of the best DeEsser’s in the market. Eiosis has heard our plea and released the E2DeEsser. The e 2 deesser is designed to be extremely easy to use for musicians and audio enthusiasts, along with the versatility, power and reliability that are required by the most demanding mixing and post production engineers. The e 2 deesser meets all the demands of the simplest to the most advanced deessing tasks, it is your ultimate deessing tool. 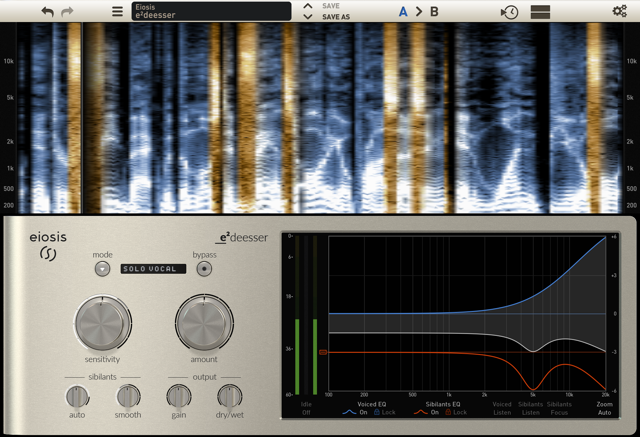 The sibilants’ section Auto and Smooth are great sounding, easytoadjust and unprecedented controls in a deesser. Auto adjusts the frequency response of the sibilants, dynamically and intelligently. Smooth brings a gentle and natural smoothing saturation in order to remove peakiness and high amplitudes from the sibilants. Plugin for Win/Mac, 32/64 bits : AAX, VST2, VST3, AU, Requires an iLok 2.